Թագավորական արքայադուստր Վիկտորյայի կնունքի Շուշան շատրվանում, փետրվարի 10-ին, 1841, Չարլզ Ռոբերտ Լեսլի. Բրիտանական Թագավորական Ընտանիք, Դիմանկար Ֆրանց Քսավեր Ուինթերհալթեր, 1846. Արքայազն Ֆրիդրիխ Վիլհելմ Պրուսիացին կնոջ և երկու անչափահաս երեխաների հետ, արքայազն Ուիլյամ և արքայադուստր Շառլոտ. Դիմանկար Ֆրանց Քսավեր Ուինթերհալթեր, 1862. 1861 թվականի հունվարի 2-ին Պրուսիայի թագավոր Ֆրիդրիխ Վիլհելմ IV -ի մահից հետո նրա եղբայրը, որը 1858 թվականից ռեգենտ էր հանդիսանում, գահ բարձրացավ` ստանալով Վիլհելմ I անունը։ Ֆրիդրիխը դարձավ թագաժառանգ, բայց հոր գահ բարձրանալով նրա դրությունը պալատում առանձնապես չփոխվեց. հայրը հրաժարվեց ավելացնել որդու նպաստը, իսկ Վիկին շարունակում էր զգալի ներդրում ունենալ ընտանեկան բյուջեում իր օժիտով և ունեցվածքով։ Բարոն Ստոկմարին գրած նամակում Արքայազն Ալբերտն այսպես է մեկնաբանել իրավիճակը. Գերմանիայում լուրջ քննադատության արժանացած ամուսինների վարքագիծը դրական գնագատականի արժանացավ Մեծ Բրիտանիայում։ «Թայմսը» գրել է.
Վիկտորյայի համար որդու հաշմանդամությունը խայտառակություն էր։ Նրա նամակներն ու օրագրերը ցույց են տալիս նրա վիշտը իր որդու ձեռքի համար և նրա մեղավորության զգացումը, որ երեխան հաշմանդամ է ծնվել։ 1860 թվականին ծնողներին այցի ժամանակ թագադիր արքայադուստրն իր ավագ որդու մասին գրել է.
Այրիացած կայսրուհին առանց վարանելու խստորեն քննադատեց իր որդու քաղաքականությունը և պահվածքը։ Երբ Կայսրը Մյունխեն քաղաքի հյուրատետրում (Guestbook) գրել էր «Suprema lex regis voluntas» բառերը (Թագավորի կամքը բարձրագույն օրենք է), Վիկին վրդովված գրել է իր մորը. Վիկտորյան և Ֆրիդրիխն ունեցել են ութ երեխա. ↑ Այս ճգնաժամի մանրամասները տես` Kollander 1995, pp. 25-45. ↑ Վիկիի և Ֆրիդրիխի քաղաքական անհամաձայնությունների մասին տես` Kollander 1995, pp. 16-17 and 79-88. ↑ 7,0 7,1 7,2 7,3 7,4 CLARA — 2008. ↑ Dobson (ed.) 1998, էջ 405. ↑ Dobson (ed.) 1998, p. 400. ↑ Dobson (ed.) 1998, p. 406. ↑ Pakula 1999, էջեր 16-21. ↑ Sinclair 1987, էջ 26. ↑ Herre 2006, p. 25. ↑ Pakula 1999, pp. 20-22. ↑ Herre 2006, p. 25 ff. ↑ Pakula 1999, p. 30. ↑ Herre 2006, pp. 32-33. ↑ Pakula 1999, p. 31. ↑ Kollander 1995, p. 5. ↑ Pakula 1999, p. 43. ↑ Pakula 1999, p. 50. ↑ Pakula 1999, p. 52. ↑ Herre 2006, p. 41. ↑ Kollander 1995, p. 6. ↑ Kollander 1995, pp. 7-8. ↑ Pakula 1999, p. 90. ↑ Herre 2006, p. 42. ↑ Pakula 1999, pp. 58–61. ↑ Pakula 1999, p. 61. ↑ Pakula 1999, p. 96. ↑ Kollander 1995, p. 9. ↑ Sinclair 1987, pp. 51-58. ↑ Pakula 1999, p. 96 ff. ↑ Pakula 1999, pp. 113-114. ↑ Pakula 1999, pp. 133-134. ↑ Wimmer, Clemens Alexander "Victoria, the Empress Gardener, or the Anglo-Prussian Garden War, 1858-88" from Garden History, Volume 26, Issue # 2, Winter 1998 page 192. ↑ Pakula 1999, p. 99 and 130. ↑ Herre 2006, p. 54 and 61-62. ↑ Pakula 1999, pp. 115-118. ↑ Röhl 1988, p. 33. ↑ Clay 2008, pp. 19-20 and 26. ↑ Wilhelm Ober: Obstetrical Events That Shaped Western European History, The Yale Journal of Biology and Medicine, n° 65, 1992, pp. 208–209. ↑ Pakula 1999, p. 132. ↑ Pakula 1999, p. 149. ↑ Pakula 1999, p. 148. ↑ Pakula 1999, p. 147. ↑ Herre 2006, pp. 74-75. ↑ Philippe Alexandre, Béatrix de l' Auloit: La Dernière Reine, Robert Laffont, 2000, pp. 236-239. ↑ Herre 2006, p. 83. ↑ Herre 2006, p. 92. ↑ Sinclair 1987, pp. 107-108. ↑ Pakula 1999, p. 169. ↑ Kollander 1995, p. 35. ↑ Sinclair 1987, p. 110. ↑ Pakula 1999, p. 181. ↑ Sinclair 1987, p. 97 and 101. ↑ Engelberg 1985, p. 532. ↑ Pakula 1999, pp. 188–191. ↑ Kollander 1995, pp. 38–42. ↑ Kollander 1995, p. 42. ↑ Pakula 1999, p. 191. ↑ Herre 2006, p. 106-107. ↑ Dobson (ed.) 1998, p. 431. ↑ Sinclair 1987, pp. 139-140. ↑ Pakula 1999, p. 219. ↑ Sinclair 1987, p. 138. ↑ Pakula 1999, p. 218. ↑ Herre 2006, p. 153. ↑ Pakula 1999, p. 260. ↑ Herre 2006, p. 154. ↑ Pakula 1999, p. 274. ↑ Pakula 1999, pp. 220–221. ↑ Pakula 1999, p. 271. ↑ Herre 2006, pp. 173-174. ↑ Die Reichsgründung 1871 in: virtual museum LeMo (Deutsches Historisches Museum). ↑ Michael Howard: The Franco-Prussian War - The German Invasion of France, 1870-1871, London, Routledge 2001, pp. 432-456. ↑ Herre 2006, p. 202. ↑ Pakula 1999, p. 98. ↑ Herre 2006, p. 128. ↑ Hagenhoff, M. Pelagia (1946) The Educational Philosophy of Friedrich Wilhelm Foerster, p.3, Washington, DC: The Catholic University of America Press, ISBN 978-1-25829-008-5. ↑ Siegfried von Kardorff: Wilhelm von Kardorff - Ein nationaler Parlamentarier im Zeitalter Bismarcks und Wilhelms II, Berlin, Mittler & Sohn, 1936, p. 112. ↑ Pakula 1999, p. 345. ↑ Herre 2006, p. 204. ↑ Herre 2006, pp. 192-193. ↑ Pakula 1999, p. 428. ↑ Pakula 1999, p. 429. ↑ Röhl, John The Kaiser and His Court, Cambridge; Cambrige University Press, 1994 page 198. ↑ Röhl, John The Kaiser and His Court, Cambridge; Cambrige University Press, 1994 page 199. ↑ Herre 2006, p. 211. ↑ Röhl, John The Kaiser and His Court, Cambridge: Cambridge University Press, 1994 page 201. ↑ Pakula 1999, p. 123. ↑ Herre 2006, p. 65. ↑ Feuerstein-Praßer 2005, p. 138. ↑ Mommsen 2005, p. 14. ↑ Herre 2006, pp. 157-158. ↑ Pakula 1999, p. 391. ↑ Mommsen 2005, pp. 353–361. ↑ John C. G. Röhl, Martin Warren and David Hunt: Purple Secret, London, Bantam Press 1999. ↑ Herre 2006, p. 233. ↑ Pakula 1999, pp. 443–451. ↑ Clay 2008, pp. 142-146. ↑ Herre 2006, p. 243. ↑ Sinclair 1987, p. 285. ↑ Herre 2006, p. 245. ↑ Pakula 1999, p. 481. ↑ Pakula 1999, p. 489. ↑ Herre 2006, p. 239. ↑ Herre 2006, p. 251. ↑ Pakula 1999, p. 494. ↑ Marc Blancpain: Guillaume II (1859-1941), Perrin, 1999, p. 21. ↑ Sinclair 1987, p. 307. ↑ Pakula 1999, pp. 514-515. ↑ Pakula 1999, pp. 520–537. ↑ Pakula 1999, p. 542. ↑ Herre 2006, p. 280. 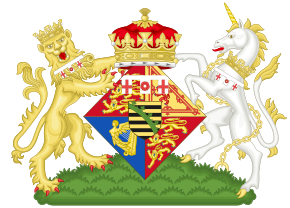 ↑ The Marquess of Salisbury, Prime Minister and Lord Privy Seal (8 August 1901)։ «Death of Her Imperial Majesty»։ Parliamentary Debates (Hansard)։ United Kingdom: House of Lords. ↑ Herre 2006, p. 287. ↑ Sinclair 1987, pp. 330-331. ↑ Röhl 1988, p. 83. ↑ Pakula 1999, p. 569. ↑ Herre 2006, p. 302. ↑ Herre 2006, pp. 306-308. ↑ Herre 2006, p. 296. ↑ Clay 2008, p. 282 and 292-293. ↑ Description in the Canadian Mountain Encyclopedia of Bivouac.com. ↑ Site of the school [retrieved 29 June 2016]. ↑ Kronprincessin Victoria von Preussen in: www.welt-der-rosen.de [retrieved 29 June 2016]. 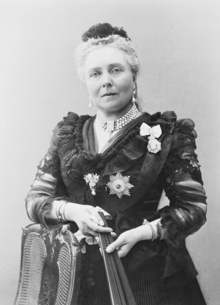 ↑ Kaiserin Friedrich in: www.ph-rose-gardens.com [retrieved 29 June 2016]. ↑ Felicity Kendal profile, imdb.com; accessed 9 April 2016. ↑ "Kaiserin Friedrich" (character), imdb.com; accessed 9 April 2016. ↑ Heraldica – British Royalty Cadency. Pakula, Hannah (1995). 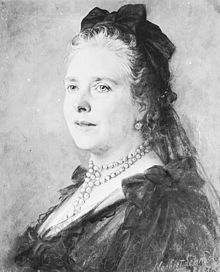 An Uncommon Woman: The Empress Frederick, Daughter of Queen Victoria, Wife of the Crown Prince of Prussia, Mother of Kaiser Wilhelm. New York: Simon and Schuster. , ISBN 0-684-84216-5։.